Extreme highlighting gives a model a certain look. The high contrast highlights really pop and add contrast to the model. It can border on the edge of looking cartoon like in some cases. This is not a bad thing either. This kind of highlighting is not for everyone, not because it's hard to do, it's just not a look that everyone likes on their models. Similar to the grim dark style I prefer, not everyone likes their models that way either. If you're one of those folks who likes the extreme highlight look, then this post is for you. 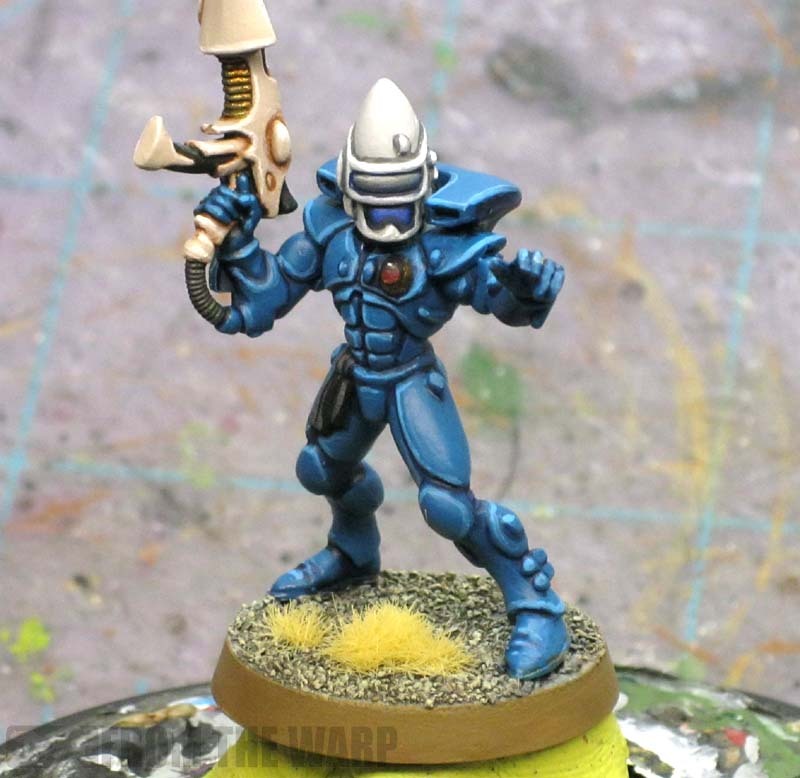 If not, you can use this post as a way to break down line highlighting into something you can use for emphasis on your more subtle looking models. Whether you use it for the high contrast look or just multiple passes of muted colors, it works either way. Line highlighting is the effect I'm going to start with here since it gives us the most control. My previous post on line highlighting makes a great jumping off point for this tutorial. We are actually going to use that same model and work on him. Note: If you haven't already seen that line highlighting post, take a minute to go back and refresh yourself with it so you can pick right up and keep moving with this post. Once we have our model painted and our first line highlight down, we are going to repeat the highlighting process again. We're going to do it two more times by the time we finish this model. Each highlight or pass will be in the same place as the previous highlight, but will cover less and less of an area along the edge we are highlighting. We are trying to use the high contrast of the highlight to really define the edge we are painting. It will make the elements on the model pop out on the table. Our first step is our model with our first line highlight (already on the model from the previous post). The second step is adding a tiny bit of white or using a lighter shade of blue and going over the upper portions of our previous line highlights. We want to focus on that portion where the light will be hitting the model. In the case of the shoulderpads, it's across the top in the middle that we will add our second pass. On the thigh though, the second pass will only be at the top of the leg plate since that will catch the light as opposed to the lower portion. Each place may be different... you can't just "hit the middle" each time with your second pass. Consistency in lighting is the key. The third pass will be within the length we highlighted in our second pass. This is really nothing more than a dot of a brighter shade of your previous color or even white in some cases. Again, keep the focus of the light and don't just drop that final highlight "in the middle." Here are the colors we used for this tutorial. The base color was the old GW Hawk Turquoise (now Sotek Green). 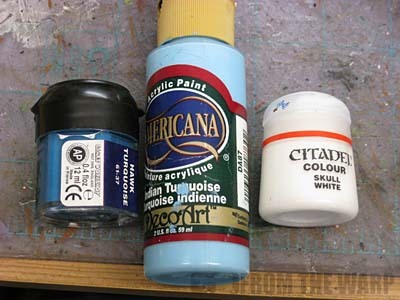 The light blue comes from Americana paints, but you could easily use GW Lothern Blue. And white is our final color. 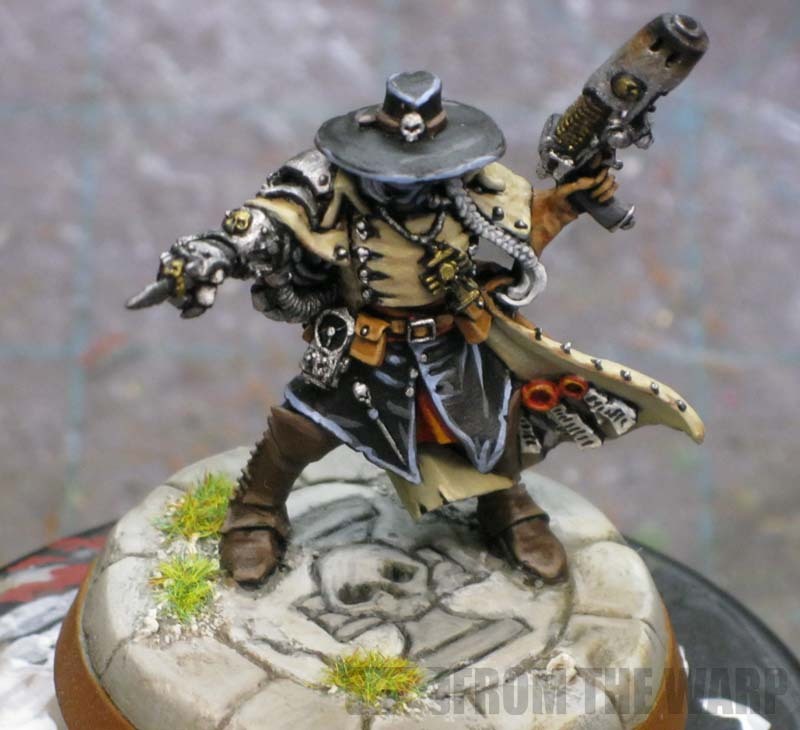 When it comes down to it, all we're really trying to do is add some high contrast to the edges of the model to make it stand out on the tabletop. The more you push the highlights, the more the element will pop... to a degree. Remember we're treading close to the cartoon look if we aren't careful. Pushing the occasional highlight a bit further than normal is something I do all the time. Especially around a model's head as it tends to draw the eye closer and make that part of a the model a focal point. Give it go on your next model. You don't have to highlight something black all the way up to white, but give it one more pass with a slightly brighter color to see what it does. You might be surprised. I really prefer extreme highlighting: when the model is going to be on the table, at arm's length, it makes details stand out much more. Darker, more realistic approaches look good up close, but I find they're much less interesting to see on the table. Here is how I extreme hightlight. I take my mini with me as I bungie jump off a bridge. i've always preferred more subtle highlights as i think they look more realistic and less gaudy on a figure but with recently experimenting with Tau XV8s I've gone for a much more extreme highlighting method which makes them look a lot more "anime". Which i think really suits them, but a bit of courage to try the first time. so this is really well timed for me - and as clear and helpful as ever! Thanks for this tutorial and your responses to my emails, very useful. Will be going back and using this on my Fleshtearers and the Chaplin!! Rushputin: True, I have noticed that very thing with my models. They seem to tend to the dark side overall. Will Wright: You're killing me here. dancing platypuss: Now you open up a whole new application when you consider the material you're highlighting. That's another dimension all together. Matt Farr: See, now there's the perfect application. It fits with how you see the models and contributes to the feeling you're trying to create with your army. Awesome highlighting!! I really like the figure you chose to show this tutorial on, where did you get it? Anon: He's an old metal 40k Inquisitor model. To be honest, I'm not sure of his exact origins. He (the figure) was given to me some time ago and I painted him and he's been sitting in my cabinet ever since.